I "met" Karen V when she emailed me commenting on my style. Ever since then I have been inspired by her artwork and lovely soul. 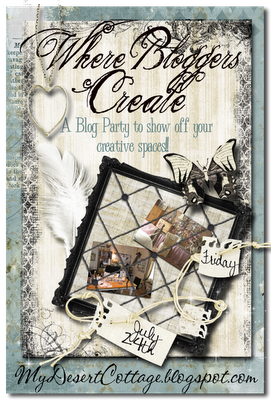 Come one and all and show us your creative spaces! All those places, big or small, that you let your creative spirit free. Click on the picture to sign up and visit lovely ladies that will be participating! Hope to see you there. PS. To my sister, Sherri, I'll help you... join in the fun sis you'll never regret! Won't this be fun...I love looking at everyone's studios! Oooh sounds like fun! I think I'll join in too! Thank you so much Sheila! I'm so excited about the party I can't stand it. I hate waiting!!! You are so sweet to help me get the word out. "See" you soon!! !